Any size, any yarn, any gauge…enter some simple measurements and generate a pattern for easy fingerless mittens that fit perfectly, personalised just for you. We created this interactive pattern for hand-spun yarns that don’t necessarily match a standard yarn weight but it works for any yarn, from sock weight to chunky. The simple design is perfect for showing off the beauty of hand-dyed yarns, including our Favourite Sock (choose the ‘4 ply’ preset), Awesome Aran (choose the ‘Aran’ preset), Marshmallow Cloud (choose the ‘Chunky’ preset) or any of our special edition yarns. The pattern is easy to intermediate level, it assumes familiarity with knitting in the round. The mittens feature an ‘afterthought thumb’ and customisable length. Special techniques are suggested for neat, stretchy edges, which are explained below and well worth the effort even if you’re a relatively new knitter. The app is in beta If you notice anything strange, let us know. Enjoy! A dense fabric makes for snug and cosy fingerless mittens. Go down one or two needle sizes from that recommended for your yarn to obtain a tighter tension. Always knit a swatch to check your tension! This pattern has been customised for a hand-circumference of cm, and measurement from the base of thumb to the finger joint of cm. Visit https://itsastitchup.co.uk/knitting-patterns/mitt-o-matic-fingerless-mittens-generator/ to view the measuring guide or customise the pattern for a different size. This pattern is customised for ?. The yardage is dependant on your mitten length and tension, but as a guide 100g is plenty for most projects. You will also need a small amount of scrap yarn in the same weight as your main yarn. Italian Tubular Cast On - This technique gives an attractive, stretchy cast-on edge to 1x1 ribbing and is well worth the effort. Sewn Cast Off (bind off) - This simple technique gives a stretchy edge to the cuff. A yarn needle is required. Magic loop - This technique allows you to work small circular projects on a long circular needle. Most knitters find this less-fiddly and faster than using double-pointed needles (DNPs). Each mitten is worked as a tube from the opening at the knuckle down to the wrist, to allow the length to be easily customised. Thumb stitches are held on scrap yarn and are picked up and worked at the end. Using the Italian Tubular Cast-On technique, cast on ? sts onto the ?mm needle. If you prefer to work an alternative cast on, make sure that it's loose enough to give you a stretchy edge. Omit the two set-up rows and work an additional ribbing round. If using DPNs, distribute stitches evenly across 3 needles. Join to work in the round, taking care not to twist work. Next round: Using scrap yarn, knit the first ? sts. Now, slide these ? sts back onto the left needle. Pick up the main yarn and knit across the stitches formed of scrap yarn, and continue to end of round, knitting every stitch. Knit to last ? sts. Then, using scrap yarn, knit the remaining ? sts. Slide these sts back onto the left needle. Pick up main yarn and knit the ? sts formed of scrap yarn (to end of round). Continue in stocking/stockingette st the round until work measures ?cm for regular mittens, or ?cm for long mittens. Without removing scrap yarn, working from right to left, use a mm circular needle or DPN to pick up the right hand loop of ? sts held on the lower edge of the scrap yarn. Turn work so that cuff faces away from you. Now pick up the right hand loop of ? sts held on the lower edge of the scrap yarn. Now remove the scrap yarn. You should have ? sts held safely on two needles. Hold work with cuff facing towards you, you will be working right to left starting at the lower line of stitches. Rejoin main yarn and use mm needle. 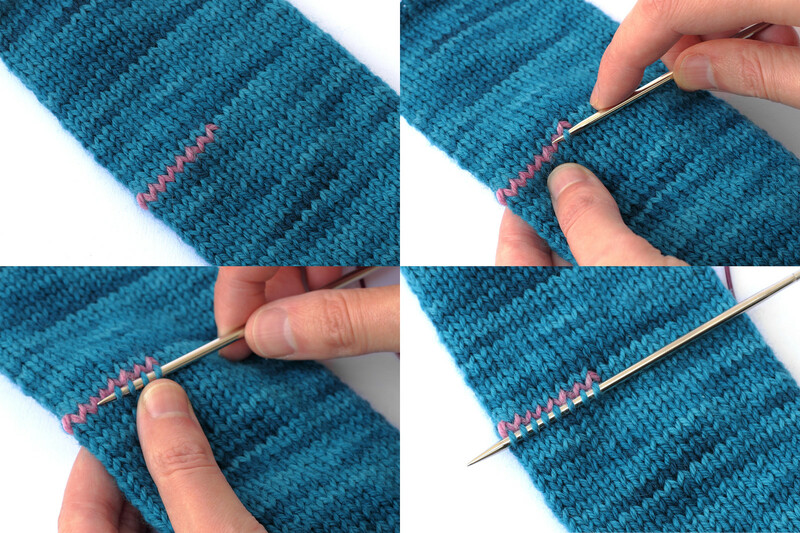 You will be picking up stitches in the gap between the upper and lower lines of stitches, do this as follows: Insert a spare needle into the underside loop of a stitch, knit through its back loop. Row 1: Pick up 1 st in the gap before the first st, knit ? sts on lower needle, pick up 1 st in the gap. Turn work so cuff faces away from you. Pick up 1 st in the gap, knit remaining ? sts from needle, pick up 1 st in the gap. You now have ? sts in total. If using DPNs, redistribute sts across 3 needles. Mitt-O-Matic Fingerless Mittens Generator by Suzie Blackman is licensed under a Creative Commons Attribution-NonCommercial-ShareAlike 4.0 International License. I found this at the perfect time. I need to knit some mitts for a child. I can tweak your formula and do it! Show off your project! Add your photo to the It's a Stitch Up Flickr group and tag it with 'mittomatic'. 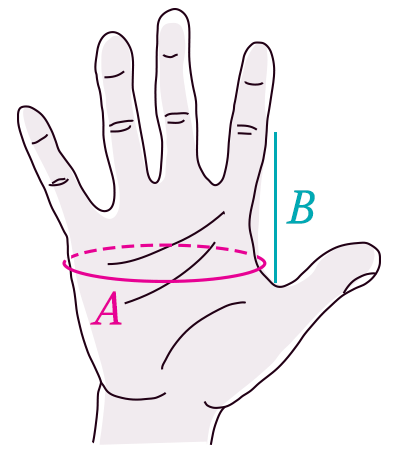 Hand circumference (A): Measure around the palm of the hand just above the thumb.